Books may now be ordered from their son, William H. Sutherland, PO Box 547, St. Paul, VA 24283 (276 762 0542) (e-mail ejsutherlandbooks@gmail.com) or on-line at (www.sutherlandbooks.com). Prices Effective February 23, 2011. If books are delivered in Virginia a 5.3 % Sales Tax must be added to the list price &, if mailed to a Virginia address, a 5.3 % Sales Tax must be added to the shipping & handling. Add the following for extra if books are mailed to, Mexico $18, Canada $11, other foreign countries $25. (2) PIONEER RECOLLECTIONS - collected by the late Judge Sutherland over more than 50 years, beginning in 1915. Many of the narrators of these recollections were actual participants in, or eye-witnesses of, the events they tell about, or they had talked to persons who were closely connected with some of the events or happenings. The 1995 edition contains 45 added pages making a total of 564 pages, with hard back cover, $75.00 (VATAX $3.97) plus $8 shipping & handling (VA TAX $.42) -total $87.39. 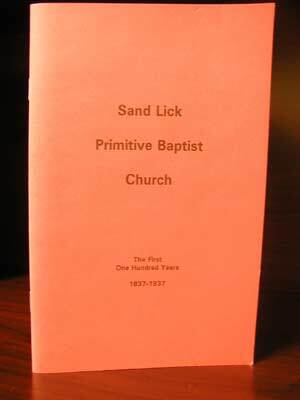 (5) SANDLICK PRIMITIVE BAPTIST CHURCH - The First Hundred Years - This history of the oldest religious assembly in Dickenson County records its organization as an arm of Reeds Valley Church in Russell County on Feb. 25, 1837, with names of members, pastors, clerks and deacons the first 100 years. In his FOREWORD, Judge Sutherland states: "Some of my earliest and happiest memories have to do with going to meeting at Sandlick Baptist Church. As a tiny lad I often went there .... on the fourth Saturday or Sunday in the month. I rode the seven long miles perched... behind my father or mother on "Old Suz," the family mule. Later, as I grew older, I frequently walked the distance .." Latest reprint, this 5.5 x 8.5 inch, 48 page, soft covered booklet sells for $5.00 (VATAX $0.26) plus $2.25 shipping & handling (VA TAX $0.12) - total $7.63. 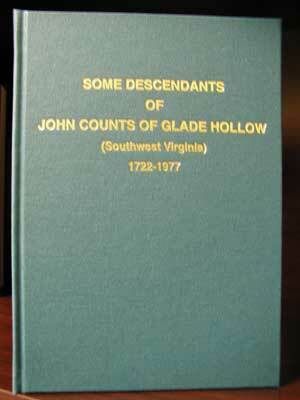 (7) SOME DESCENDANTS OF JOHN COUNTS OF GLADE HOLLOW (Southwest Virginia) VOLUME 2 -- 1722-2003 (Supplement) Published in 2003 the 850 page, 8 ½ x 11 inch hardback. with 173 photos, supplements Volume 1 (Item 6) following the format of the Volume 1; but includes only persons in Volume 1 on which new information is available and as much of Volume 1 as is needed for continuity in parentage. Includes the families of Addington, Adkins, Amburgey, Anderson, Arrington, Artrip, Baker, Ball, Barton, Belcher, Blankenship, Boggs, Bowman, Branham, Breeding, Brown, Carter, Childress, Colley, Combs, Compton, Crabtree, Damron, Davis, Deel, Dickenson, Dotson, Duty, Dye, Edwards, Evans, Fields, Fleming, French, Fuller, Garrett, Gibson, Gilliam, Grizzel(l), Hale, Hall, Hammons, Hay(es), Henderson, Henry, Hibbitts, Horn(e), Hughes, Jessee, Johnson, Jones, Keel, Kins(z)er, Kiser, La Force, Lambert, Lee, Lewis, Long, Lyon(s), McCowan, McCoy, Martin, Meade, Miller, Minton, Moore, Mullins, Musick, Newberry, Oquinn, Osborne(e) Owens, Phillips, Powers, Pressley, Puckett, Quesinberry, Ramey, Rasnake (Rasnick), Rice, Riddle, Robinson, Roe, Rose, Salyers, Scott, Sexton, Silcox, Skeen(s), Smith, Stanley, Steph(v)ens, Street, Sutherland, Swindall, Sykes, Taylor, Tiller, Turner, Vest, Viers, Wagner, Wallace, White, Williams, Willis, Wilson, Wood, Wright, & Yates. Price $60 (VATAX $3.18) plus $9 shipping & handling (VA TAX $.48) - total $72.66. Known corrections & additions to this book posted on www.sutherlandbooks.com July 2012. 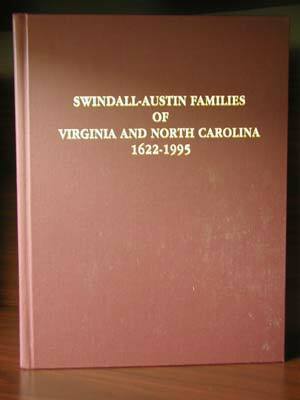 (8) SWINDALL AND AUSTIN FAMILIES OF VIRGINIA AND NORTH CAROLINA 1622-1995. Published in 1995, the 416 page, 8 1/2 X 11 hard-covered volume has over 200 photos and includes the related families of Abdon, Addington, Alexander, Allen, Bently, Beverly, Bolling, Bullock, Brown, Calloway, Childress, Clore, Craft, Corporon, Countiss, Curtwright, Davis, Dotson, Elliott, Elsbery, Enochs, Fleming, Fletcher, Graham, Grizzle, Hamilton, Hash, Hayden, Heaberlin, Hibbitts, Hillman, Holohan, Hopkins, Hubbard, Hughes, Johnson, Keene, Killen, Landreth, Leavene, McFall, Martin, Mathews, Maxey, Mullins, Noel, Phipps, Potter, Powers, Rector, Renfro, Rife, Rose, Rouse, Shortt, Smith, Stallard, Stephens, Tipps, Vance, Vanover, Watkins, Whitt, Yeager and many others. $45.00 (VATAX $2.38) plus $7 shipping & handling (VA TAX $.37) - total $54.75. 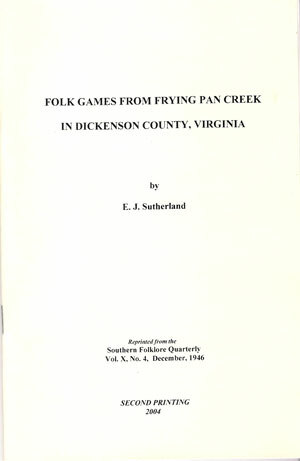 11) FOLK GAMES FROM FRYING PAN CREEK IN DICKENSON COUNTY, VIRGINIA (2ND Printing) Prepared by Judge E J Sutherland. A reprint of his article in the Southern Folklore Quarterly (Vol X, # 4, December 1946). All games or plays described herein were collected on Frying Pan Creek ..., near the junction of Virginia with West Virginia and Kentucky. These plays were recorded to preserve them while they were still fresh in the minds of many of the older citizens of this mountain section. A 28 page 6 x 8.5 inch paperback. $5 (VA TAX $0.26) + shipping $2.25 (VA TAX $0.12) - total $7.63.